Struggling to pick which edition of Assassin's Creed: Origins to buy? This guide should help you decide. 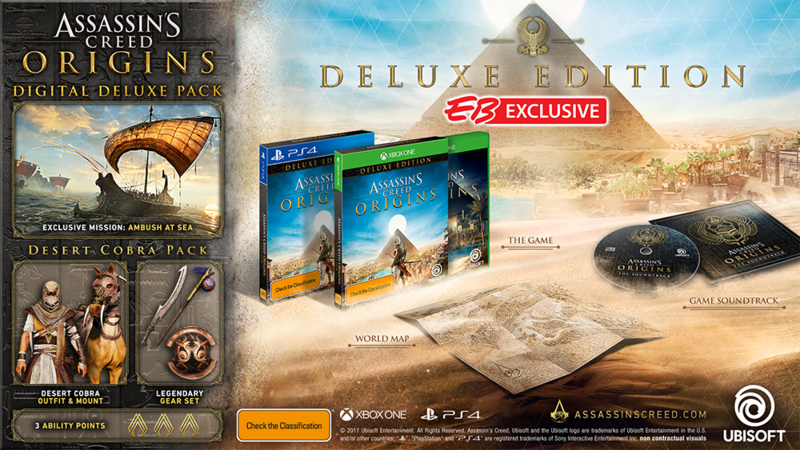 ​Pre-order Assassin's Creed Origins at EB Games to receive an exclusive Pin! ACO Hoodie, T-shirt, Handkerchief and Scarf. 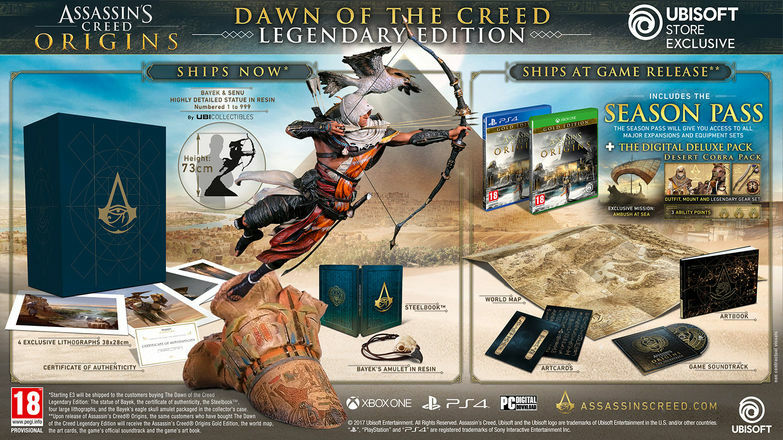 Hungarian Retailer www.gamersroom.hu are offering two exclusive Assassin's Creed Origins pre-order bonus items! Microplay France are giving away official Assassins' Creed Origins thumbsticks when you pre-order the game! 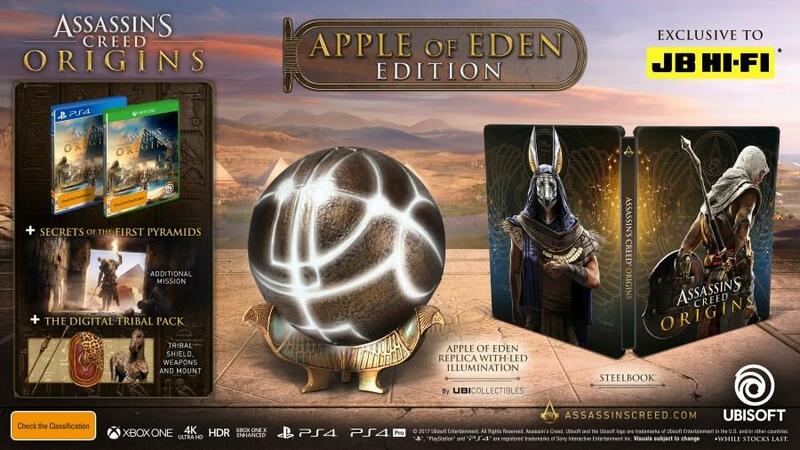 Includes the game and the Deluxe Pack. - The Ambush at Sea mission. Fans, the horse: This tusk-toting horse stirs fear in the hearts of your enemies. Eye of Apep legendary blunt weapon: This snake may not bite you, but you will feel it's sting. The fang legendary sickle sword: The Fang is designed to shred in pieces anything it touches. Three additional ability points to enhance your Assassin's starting skills. Celebrate the birth of the Brotherhood with the Assassin’s Creed® Origins - Dawn of the Creed Collector’s Edition. 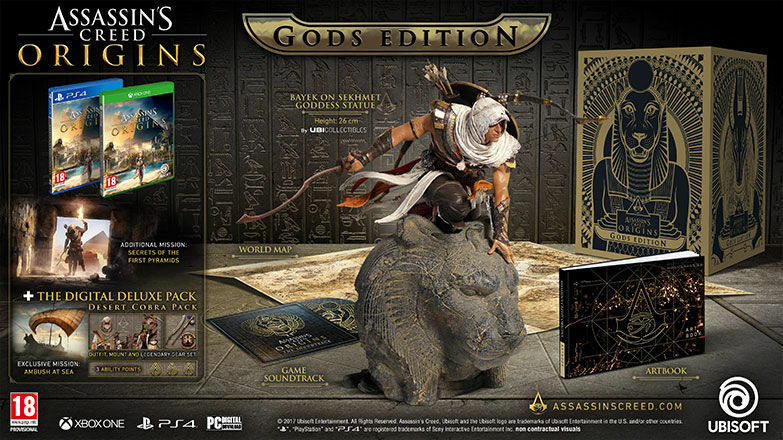 Featuring a 37cm figurine of Bayek, a protector of Egypt whose personal story will lead to the creation of the Assassin’s Brotherhood, and his eagle Senu. This Collector’s Edition is available exclusively on the Ubisoft Store. The Assassin’s Creed® Origins Gold Edition, including the Season Pass and the Digital Deluxe Pack. High-end Bayek & Senu figurine (height 39cm) - By Ubicollectibles. A replica of Bayek’s eagle skull amulet. - Four big lithographs, signed by the artists of the Ubisoft Montreal Studio. This edition is available exclusively at the Ubisoft Store.